Home to more than 2,000 sandstone arches, natural bridges, towers, rock fins and other awesome formations, Arches National Park is a take in its wonders, hike its scenic trails, and explore its canyons. From ancestral foraging and hunting grounds, to rugged frontier, to tourism hot spot, Arches has shared a variety of special relationships with humans throughout its history. In the last century, the citizens of nearby Moab have worked to promote the park not only as a symbol of the city, but also of Utah itself. 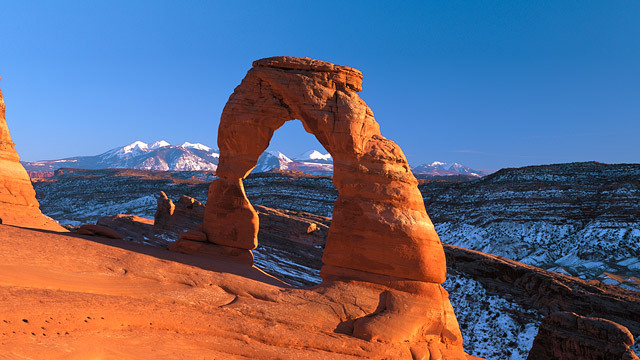 Delicate Arch, the most widely-recognized landmark in the park, has appeared on Utah’s license plates and postage stamps. Interestingly, it and many more of the park’s famous sightseeing spots were not included in its original land grant, when it was founded as Arches National Monument in 1929. However, expansions of the park’s territory protect more than its iconic rock features — Arches National Park’s delicate, intricate ecosystems are home to an abundance of specially adapted wildlife, including some species on the road to recovery. Facilities at the park are somewhat limited. If you’re looking to camp out in Arches, it’s advisable to make a reservation. Additional accommodation and amenities can be found in and around Moab. Click to see a detailed Arches National Park map.